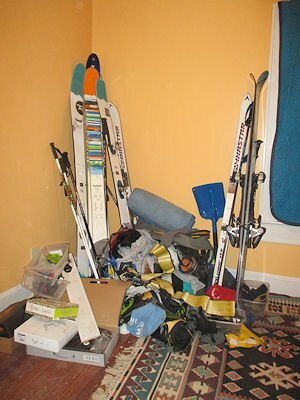 At the end of last season you stuck all your gear in a trunk, or in the back of a closet, or under your bed, perhaps in your attic or crawlspace. Wherever it is stored – the time has come to deal with it. It must all be collected, tagged and possibly fumigated. The polypropylene long johns and the socks you meant to wash are now a science project. They need to be separated and repeatedly laundered; and probably not just the long johns now but everything, including tents, beach umbrellas and anything else stored nearby and not made of stainless steel. So take everything out and put it in a heap, separate anything with mold, but otherwise do not try to make isolated decisions. Before you try to process it all take a good long look…just LOOK…why do you have so much gear? How did this happen? Generations of people lived in the frozen reaches of the arctic with nothing more than what they could carry in a single seal skin. Will this even fit in a shipping container? Of course the same questions occurred to you at the beginning of last season and the one before that, so best write these off as imponderables and move on. 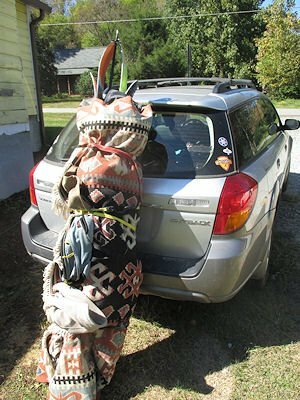 Move on and fix it – one way is to make quick arbitrary decisions, toss random items onto a rug until it looks full, roll it all up and throw it in the back of your winter capable car. This is the Carpet Bag Method, and it is quick and easy but not without risks. 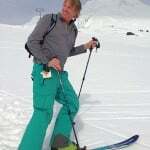 Aside from the fact that you will likely hit the slopes with three unmatched skis, a single pole and a boot; this method is also prone towards suspicion and arrest, especially if any skiers have recently turned up missing in the area where you’re going. A better course of action is to take a little time and approach the problem with careful thought and calm deliberation. Unfortunately it is hard to remain calm or be thoughtful in the face of this unfathomable heap of … stuff. Was that a mouse that just jumped out of the fleece cap? Something must be done to make things more manageable and here are some additional techniques that I have devised. The St. Paddy’s Day Method: Choose a color – say teal – and separate any items that are teal and throw everything else away. Like the Carpet Bagger this is quick and efficient but it has the disadvantages of you looking like a leprechaun and ending up at the ski slope with nothing but socks, a helmet and some bright green pants. A better approach is to start with the Rule of Threes. 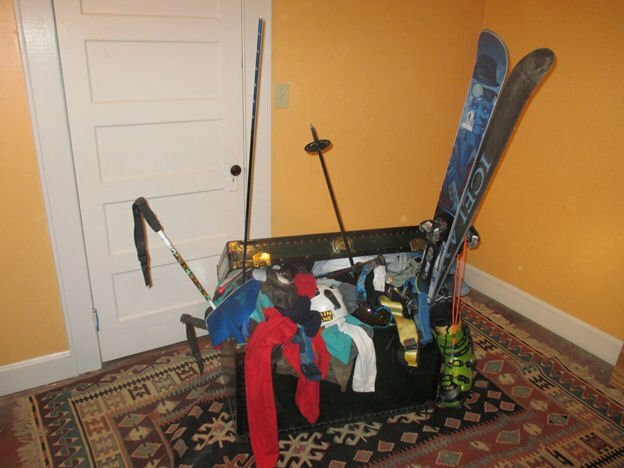 Aside from pairs of socks and clean long underwear, you don’t need THREE of anything. 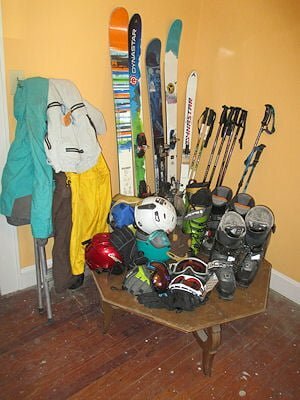 If you have three or more coats, goggles, sets of poles or even skis you need to justify these possessions. Really? three helmets, one of which has so many dings and dents that it offers about as much protection as a crumpled beer can? You need to be ruthless and seriously divest yourself of some of your cherished junk. Boots that hurt last year will still hurt; poles that were bent like a pretzel have not healed themselves in your garage during the summer. This can all be very painful, even traumatizing for a pack-rat (hoarder) such as yourself (me) but fortunately there is a special dispensation that can be invoked. The Benevolence Exception, that being that if you are saving things for your children or friends or needy people who live on the frozen tundra; then you can store them again into perpetuity. So place benevolent items on the left and the remainder on the right. This is not bad…good progress. 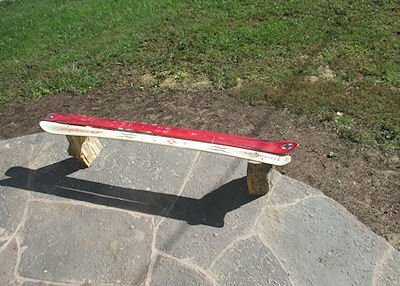 A note about skis, it might seem that I am ignoring my own rules with too many pairs of skis, but I can justify that; some have adjustable bindings and I keep them as a public service for others to demo; and anyway there is also the Rule Of Chairs which holds that skis can be stored indefinitely since you can eventually turn them into patio furniture. Now that you have a manageable base on which to build, there are three categories of packing – the one day trip, the more than one night car trip, and the trip that involves an airport. Interestingly and contrary to conventional wisdom, the first one can be the most challenging. 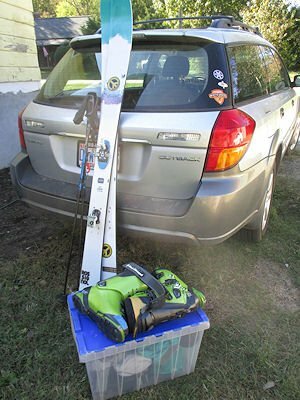 Largely because if it is the first outing of the season you are dialing in your packing skills; and like the perfectly executed falling leaf turn, this is an art form. 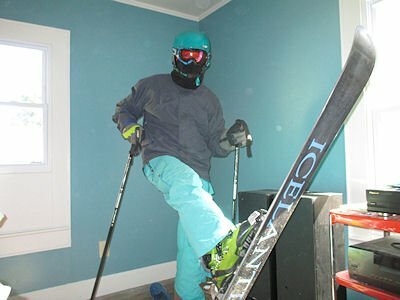 The first day trip is when all the rookie mistakes are made; for example, you bought a pass, had it mailed to you, but then arrive at the lift only to realize you left it at home beside your framed portrait of Franz Klammer. Attach the pass now to the jacket or pants you will be wearing and voila, another catastrophe averted. So get one day’s worth of essentials together. Now go ahead and just do a dry run, try everything on in your living room. After you have thoroughly annoyed your non-skiing significant other and frightened all the pets, duck walk out to your front yard. Tramp around for a while, really get the feel of your gear and verify that your setup is complete. 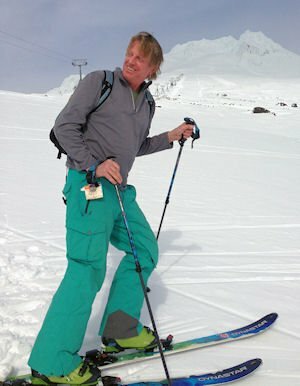 Imagine yourself atop a cornice with a wide open bowl falling away beneath you; clack your poles loudly overhead and shout to your neighbor across the street, “Dropping !! !” He’ll understand, or not. The day trip package is the foundation that all else is built on. Get it right and you are prepared for a great first day. Then, think of it as the base layer for the longer drives and flights to come. An extra set of street clothes and two more sets of socks and thermals and you are good to go for days. You should do all this soon, do not wait until the night before your first 5 am departure. This way you may actually get first chair on your first day, which of course means you win.